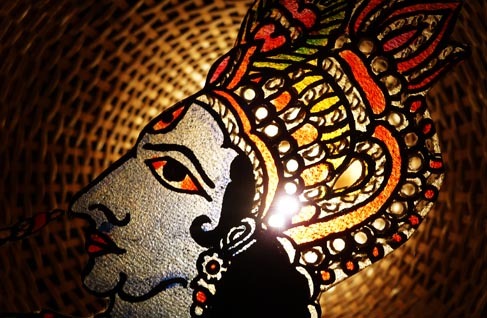 About Product : An age old leather craft technique drafts characters out of our favorite folklores.. reminding us of a Byzantine tale in today's times... let these lively puppets parade straight into your spaces.. creating an orchestra of illuminating colors & flawless gestures.. In the dark of the night, loud beats of the drum and cries of the war horn fill the sweltering air, while glowing kings and demons fight across the flickering light. 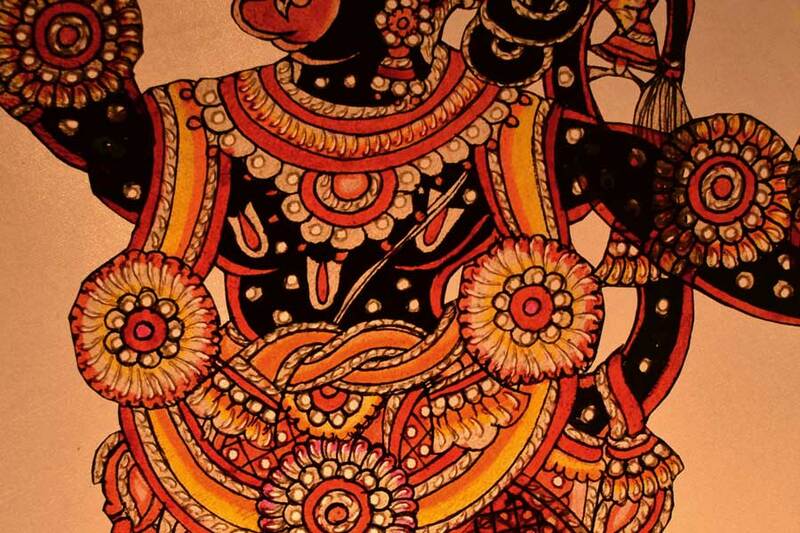 As early as the twelfth century, the art of puppetry flourished in Andhra Pradesh, narrating stories of divinity, sometimes taking the divine dimensions itself. Stories from the great epics Ramayana and Mahabharata were performed and went on for several nights. The puppet shows had something for everyone – divine epics for the devout; and comic relief for the distracted. Puppetry is still practiced today, especially during festival occasions, although not many puppeteers practice this art nowadays. 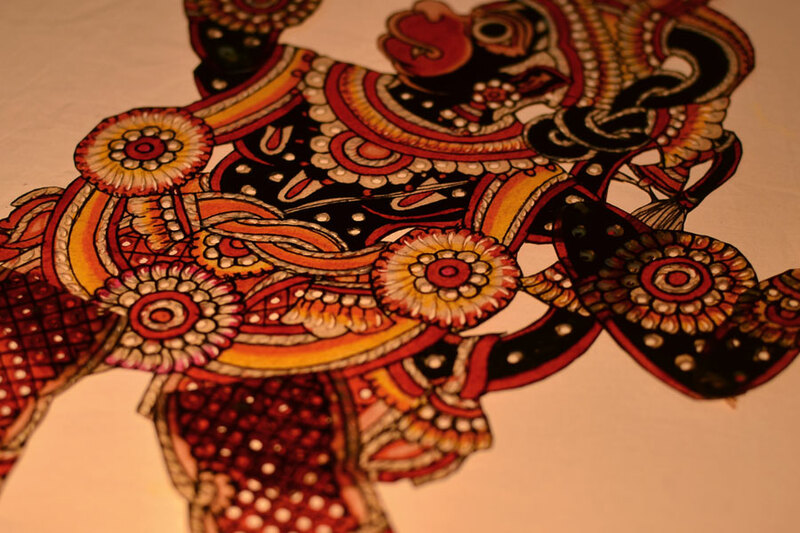 Leather shadow puppetry of Andhra Pradesh is known as Tholu Bommalata, (Tholu – leather, Bommalata – puppet dance). 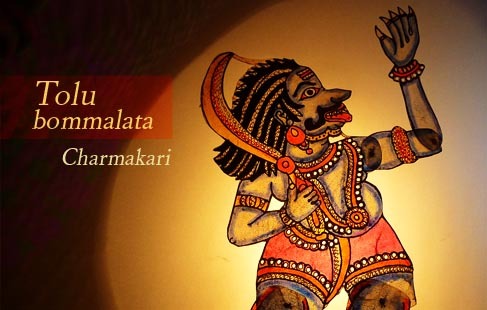 Two other kinds of shadow puppetry are practiced in Andhra Pradesh, the Sutram Bommalata (String puppets) and the Koyya Bommalata(Wooden puppets). 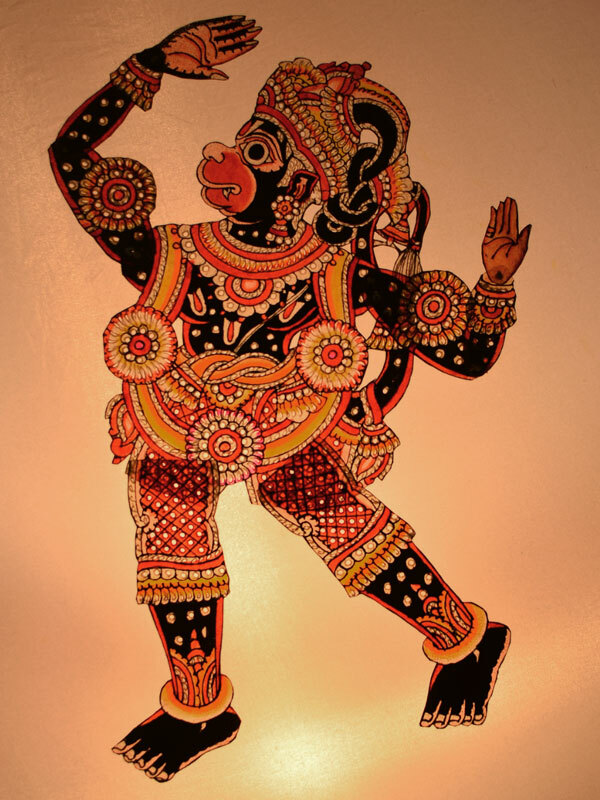 The leather puppets, because of their transparency and jewel like glow, are most popular. 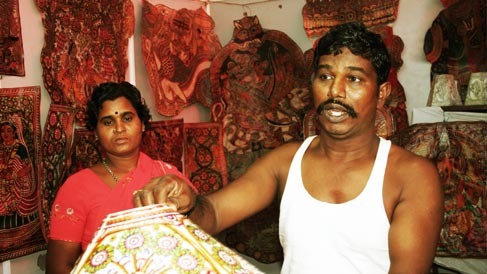 Madhavapatnam, near Kakinada, DCPalli in Nellore district, Nimmala Kunta in Anantapur district and Narasaraopet in Guntur district are the main centers for leather puppets. The leather puppet, which was traditionally crafted from deer skin, is made from goat hide now. After a two week long process of cleaning, the skin becomes translucent and ready for the artwork. As with most crafts, in the painting of leather too, chemical colours are replacing natural ones. Different characters have their designated colours, for example, blue for Rama and Krishna, green Anjaneya, yellow for rishis and so on. But apart from the translucency and vivid colours, what gives these puppets their brilliance, is the perforated designs drawn on the characters to depict jewellery. Once surrounded by colour and viewed against the light, they look like glowing jewels. The sizes of the main characters range from 4’ x 1½’ to 6’ x 2½’. Smaller puppets, around 1’ in height, are also made, for supporting characters as well as for selling to tourists. Some of the characters are made in three different sizes for a sense of perspective as well as prominence. As the character is shown to move away, a smaller puppet replaces the larger one and vice versa. Each puppet is controlled by one person with the help of a bamboo stick attached to the back and the performer also sings for the character he manipulates. The movements of the puppets are very intricate, with the larger puppets having up to 13 different movable body joints. Fight scenes make the most of such complex movements and also keep up the tempo of the performance. Fables from Ramayana and Mahabharata that remain popular include tales of Lava Kusha, Keechaka Vadha and Rama Ravana Yuddham. Today, the puppeteers have diversified into different products using the same craft; as puppet shows are not a mainstream medium of entertainment anymore. The transparency and durability of the material makes it perfect for lampshades and screens, enlivening any dull, grey room. 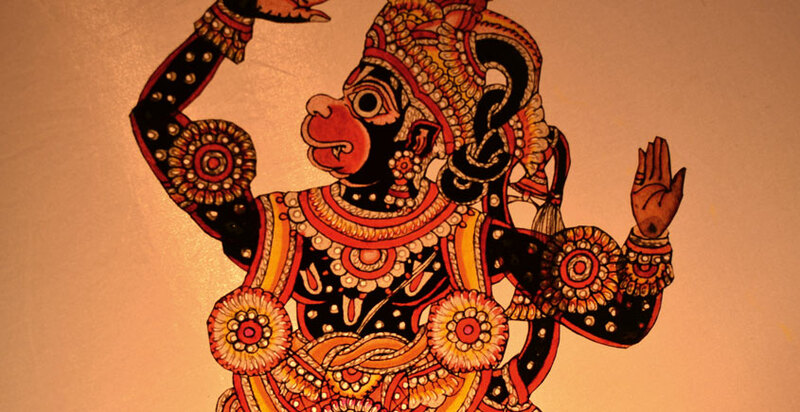 The puppet theatre is evolving with time, with epics getting interwoven with popular myths and tales. Performances that would go on for 6 nights for Ramayana and 18 nights for Mahabharata are now reduced to just an hour’s show. Bright electrical lighting has replaced mild earthen lamps but the magical glow of the characters and their phantasmagorical narratives still transport the audience to the surreal world of divine sagas. Recently a workshop was conducted in Nimmala Kunta in Anantapur district one of the main centers for leather puppets. The main focus of the workshop was to work with the traditional leather puppet artists and bring in the designs, colours, shapes and forms of the traditional craft into jewelry design. The translucency and vivid colours, that give these puppets their brilliance, when viewed against the light, they look like glowing jewels. The transparency and durability of the material makes it perfect for statement necklaces and colourful earrings that light up any outfit.